Semi-detached bungalow within a highly sought after location and comprising double glazed entrance porch, hallway, bay fronted lounge, bedroom 1, spacious dining room to open to newly installed quality fitted kitchen with integrated appliances, rear porch to west facing garden, luxury new installed bathroom & stair to upper floor leading to two attic bedrooms. Warmed by gas central heating the property also benefits from being double glazed and has been fully redecorated and carpeted throughout. The dining kitchen offers modern living accommodation with quality high glass wall and base units and separate utility area and door to porch which gives access to the west facing rear garden with views over Old Prestwick Golf Course to the Isle of Arran The gardens are easily maintained the front being walled, paved and chipped whilst the rear garden is enclosed child and pet friendly with patio drying lawn, timber shed and steps down to small garage which is accessible from the lane to the rear. 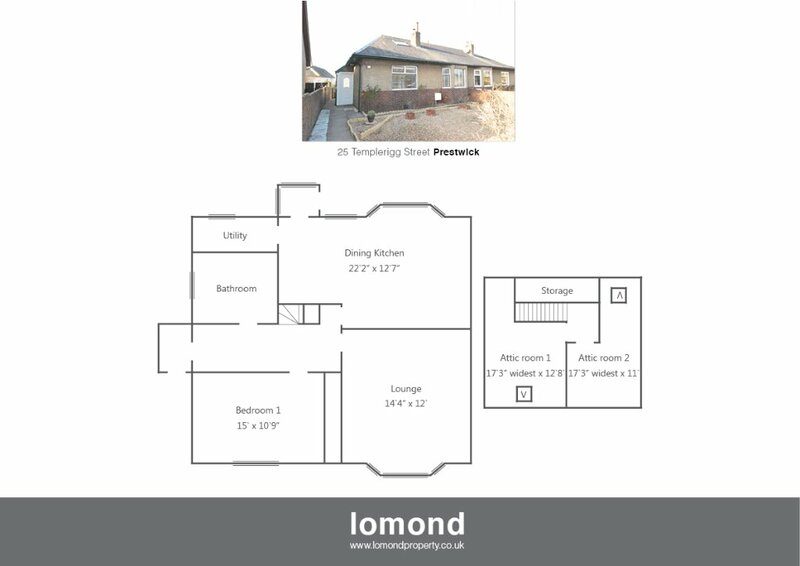 The property is ideally located within a sought after area of Prestwick only a short walk to local shops, bars and restaurants. Minutes from public transport by road and rail and convenient for local schools. From our office on Prestwick Main Street proceed north through traffic lights ar Prestwick Cross. Take the first on the left into Kirk Street then left onto The Riggs then right onto Templerigg Street where the property is located at the far end on the left.